June Jam by Ron Roy, a Mysterious Review. 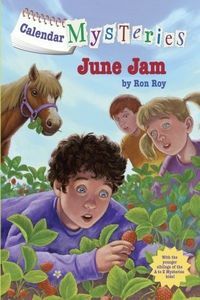 Review: The Pinto kids decide to make their Dad some strawberry jam as a present for Father's Day, using their Grandmother's special recipe, but a mystery creature has been nibbling at all the fruit in their garden, in June Jam, the sixth "Calendar Mystery" in this series of early chapter books for children by Ron Roy. When twins Bradley and Brian first discover the damage, Brian declares, "There's a strawberry monster in our garden!" Their friends, Nate and Lucy, convince them to look for evidence on how a monster could have entered the garden, and check every inch of the surrounding fence. But that's a mystery, too. "Well, if it can't get over the fence," Nate says, "and it didn't go under the fence, it must have gone right through the fence!" Brian concludes the strawberry muncher can only be a ghost! Can the four friends find out what — or who — is eating its way through the family garden? The kids are at the top of their game in June Jam, coming up with creative ways of identifying the creature, or failing that, scaring it off. When they do discover what it is, some readers may be a bit puzzled … but a quick look at the map of their community that precedes every book in this series will quickly explain how it is possible. Everything works out for the kids and their Dad for Father's Day, but it's fun to imagine an alternate ending: When the kids find their Grandmother's recipe, which calls for the sweetened fruit to be cooked — something they're not allowed to do without the supervision of an adult — they decide on the next best thing: making it without cooking. Even though it doesn't come to fruition, as it were, it would have been interesting to see how their uncooked strawberry jam would have turned out! June Jam is labeled by the publisher as RL 2.1 (2nd grade reading level). No Lexile measure has been determined for the book. A complete list of titles in this series can be found at First Clues: Calendar Mysteries. Acknowledgment: Random House provided a copy of June Jam for this review.